Bronze Award for Zak and Edward . 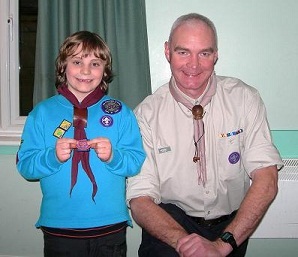 Zak Harries of Redwood Colony became the first Beaver to gain the Chief Scout's Bronze Award in 2010, when he received the badge from Ian Stott, the District Commissioner for Havant. 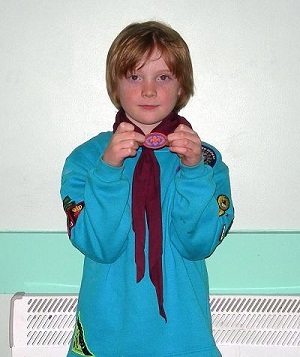 The following week it was the turn of Edward Dyer of Aspen Beavers to receive his award. The badge was presented by Ian Hawke on behalf of Ian Stott. As Leaders we undertake the Scout Adult training programme which consists of 18 modules that collectively provide us with lots of ideas, First Aid, leadership skills, working with young people that help us deliver safe and exciting Scouting. 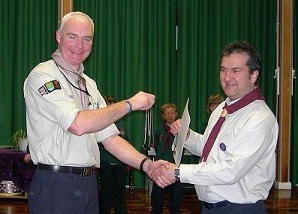 Shawn Lambert, having completed his training was presented with his Wood Badge by Ian Stott. 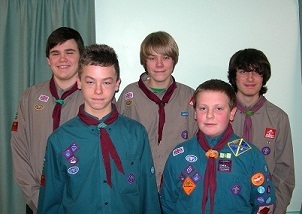 5 Hayling Scouts have been invited to take part in International Expeditions in 2011. Michael Kenny, Matthew Kenny and William Nelson (back row) all members of Nexus Explorer Unit along with Jack Golden (bottom right) of Eagle Troop will join 40,000 others at the next World Scout Jamboree in Sweden. Scott Hickman (bottom left) also of Eagle Troop will join an expedition to Denmark. Congratulations to Dennis Doney, Brenda Kenny and Sandra Reed who each won £25 in our latest draw. We are now renewing membership for the 2010 club and existing members will receive a form and details in the next few days. A copy of the form is being sent home to every parent and for our supporters you can get a form from our website or by contacting Ian Hawke. Those Scouts attending the World Jamboree 2011 in Sweden need to raise over £2000 to take part. About 25% of this total is to help Scouts from the poorer Countries of the world to be able to send a contingent to Sweden. To help with these costs, a number of events are being planned over the next 12 months. The first of these is a family quiz that will take place on Saturday 20th February. The cost is £5 per person to include a Ploughman's Supper. To book your team please select the Family Quiz logo above Latest News on the home page of our website (www.haylingscouts.org.uk) or contact the Kenny Family on 92468093. Other events include a Race Night on April 24th, Car Washing. Details when known will appear on our website and in our newsletter. The Scouts are also looking for jobs appropriate to their age and ability to raise money towards their expeditions. If you have any jobs then please contact us and we will assess whether or not we feel able to help. You can either send an email to gsl@haylingscouts.org.uk or contact Ian Hawke. Peewit Patrol of Eagle Troop won the District Cooking competition just ahead of Otter Patrol from Hayling Lions. Each patrol taking part were given the same ingredients and devised their own menus. Peewit patrol used the Salmon and salad for their starter followed by Turkey and vegetable stir fry and the meal finished with their own form of fresh fruit cheesecake. Where we have an email address, you should have received details of this event being organised by the Lions Club of Hayling. Don't forget that you need to book a place in the auditions on the 14th or 21st February. We know that amongst the members of the group we have some incredible talent - so now is your chance to show it! In Scouts we often set challenges for the patrols. These challenges often involve providing them with some equipment and then setting them an objective. 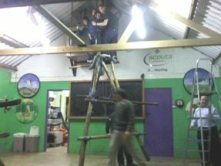 Pioneering challenges, building something out of ropes and poles prove to be great fun and recently Ed set Eagle troop the challenge to build a frame to get the whole patrol as far as possible off the ground. Please make a note in your diaries for this event which is on a theme of "basics of Scouting". More details after Easter. Every January we have to complete a census return for the Group. The Census includes all of our youth sections, plus leaders, our Group Development Team and other regular helpers. It is great to report another growth in our youth membership, particularly with the Scout section and overall we show a growth of 12% on 2009. This is the 5th consecutive year when our numbers have grown. Clearly the Leaders are doing something right!! 27th Cub District Football Comp.